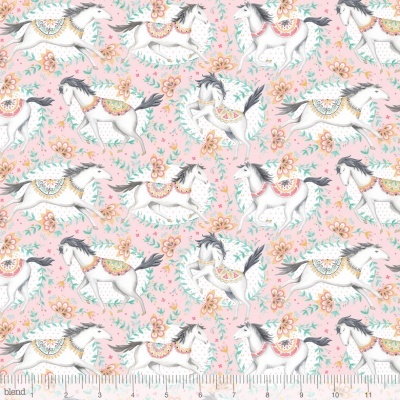 Pretty horse design on a light pink background, 100% cotton from the Blend Hill & Dale cotton collection. 112cm / 44" Width, this fabric weighs approximately 150gsm. Multiples of a size will be cut as one piece unless requested otherwise. Blend describe themselves as a high-end textile design company that's a collective of many artists work, with a mixture of styles from both well-known designers and some that are best-kept secrets.